Tulsa Council of the Blind: Springtime in Oklahoma Means Storm Season! Yes, it’s spring time in Oklahoma and that means storm season! Just as a reminder to us all, below are some safety tips from the city of Oklahoma City to help you prepare for tornado season. If you are outdoors: If possible, go inside a building. If shelter is not available or there is no time to go indoors, lie in a ditch or low-lying area or crouch near a strong building. Be aware of the potential for flooding. Use your arms to protect your head and neck. Have regular tornado drills with your family. Designate an area in your home as a shelter, and regularly practice having your family go there as if there were a tornado. Have disaster supplies on hand. Have a plan for getting back together in case family members are separated from one another during a tornado. Ask an out-of-state relative or friend to act as the family contact. After a disaster, it's often easier to call long distance. Make sure everyone in the family knows the name, address and phone number of the contact person. in the background and farmhouse in front. When a tornado is coming, you have a short amount of time to make life or death decisions. Advance planning and quick response are the keys to surviving. If you are at home: Go to the basement, storm cellar, or the lowest level of the building. If there is no basement, go to an inner hallway or a small inner room without windows, such as a bathroom or closet. Get away from windows. Go to the center of the room. Stay away from corners because they tend to attract debris. Get under a piece of sturdy furniture such as a workbench or heavy table and hold on to it. Use your arms to protect your head and neck. If you are at work or school: Go to the basement or to an inside hallway at the lowest level. Avoid places with wide-span roofs such as auditoriums, cafeterias, large hallways, or shopping malls. Get under a piece of furniture such as a heavy table or desk and hold on to it. Use your arms to protect your head and neck. If you are in a car: Get out of the car immediately and take shelter in a nearby building. Never try to outdrive a tornado. 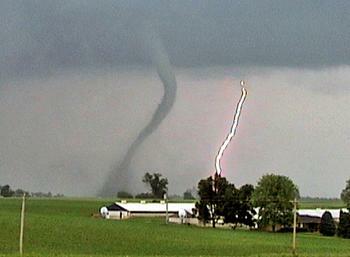 Tornadoes can change direction quickly and can lift up a car or truck and toss it through the air. If there is no time to get indoors, get out of the car and lie in a ditch or low lying area away from the vehicle. Be aware of the potential for flooding. Do not take cover under a bridge! What should I do if I live in a mobile home? Mobile homes are particularly vulnerable. A mobile home can overturn very easily even if precautions have been taken to tie the unit down. When a tornado warning is issued, take shelter in a building with a strong foundation. If shelter is not available, lie in a ditch or low-lying area a safe distance away from the unit. Help injured or trapped persons. Give first aid when appropriate. Don¬t try to move the seriously injured unless they are in immediate danger of further injury. Call for help. Help your neighbors who may require special assistance, infants, the elderly, and people with disabilities. Turn on a radio or television to get the latest emergency information. Stay out of damaged buildings. Return home only when authorities say it is safe. Use the telephone only for emergency calls. Clean up spilled medicines, bleaches or gasoline or other flammable liquids as soon as possible. Leave the building if you smell gas or chemical fumes. Take pictures of the damage, both to the house and its contents, for insurance purposes.